Nestled where Boca Raton meets Delray Beach, The Bridges is one of the area's finest and most spacious communities, with brand new custom homes and a fresh feeling of luxury. After years of meticulously refined planning and development by GL Homes, homes for sale in The Bridges, Delray Beach offers distinguished residents waterfront, garden-view and cul-de-sac options in addition to luxurious amenities unique to the community. Find out what draws people to the Bridges homes, or browse through some of the listings below and see for yourself! At the center of The Bridges real estate, among beautiful views of the sparkling lakes and luscious landscaping thoughtfully designed for higher-end tastes, lies an opulent 17,000 square foot clubhouse. It boasts a beautiful social hall, catering kitchen, yoga studio, fully equipped fitness center with locker rooms and saunas, as well as indoor and outdoor facilities for your favorite sports like basketball and volleyball. 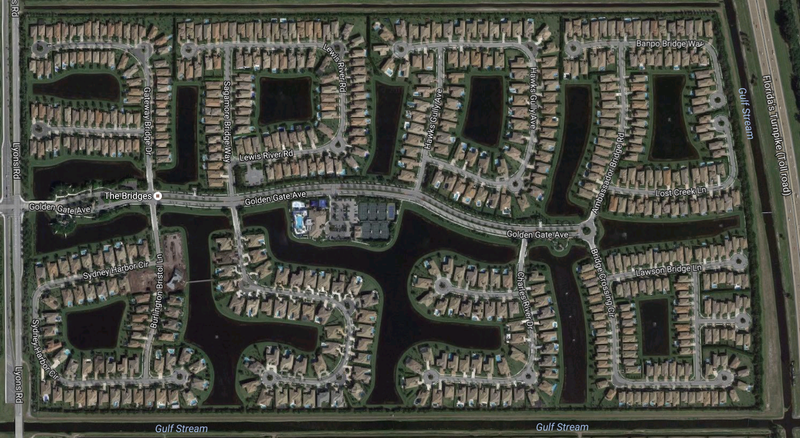 Bridges is a gated community located in West Delray Beach. There are also facilities for tennis enthusiasts: residents can enjoy six Har-Tru courts and one hard court, lit for night play if so desired. The astonishing complex is also home to a Tennis Pro shop, shaded pavilions, a spectator viewing area, and various activities for children including a wading pool, game-room and children’s center. A favorite at the clubhouse, the Bridges' café gives residents and their guests the opportunity to enjoy a quick meal or spend a luxurious afternoon near the resort-style pool lunching on fine cuisine. The Grille is open for breakfast, lunch, and dinner and, of course, provides pool-side service to its guests. Close to shopping, nightlife and great schools, The Bridges offers 21 distinctive home designs ranging in size from 2,450 to more than 7,506 air conditioned square feet with one- and two- story plans, many of which are set on waterfront properties. Homes for sale at The Bridges include many high-end new construction homes, offering an array of luxury amenities. The homes' "standard features" are far from ordinary, indeed. Potential buyers can choose from a myriad of combinations to suit their distinctive tastes that encapsulate open floor plans with glamorous, bright foyers, designer ceramic floor tiles, elegant bar with designer cabinets, and outstanding bathrooms and kitchens designed meticulously for the most distinguished buyers. Work with Boca Premier Properties to find your new The Bridges home for sale, one of the top homes for sale in all of FL. We have the knowledge, experience and expertise to help ensure that your dream home doesn't slip through your fingers. Understanding the market conditions, knowing which properties will suit your lifestyle on a long-term basis and having a clear vision for the real estate landscape in The Bridges is what helps set us apart from our competitors. Learn more about the The Bridges real estate market or any listings in the surrounding area. Don’t wait, homes in this community sell fast. Contact Jean-Luc Andriot today to learn more about homes for sale in The Bridges. The sale or acquisition of real estate is a process, not an event. Let us support you with our knowledge and experience. For more information on The Bridges homes for sale or to schedule a private showing, call your Delray Beach real estate specialists – Boca Premier Properties at 561-406-8880. As your real estate agent for The Bridges Delray Beach, Boca Premier Property Group can assist you with all of your home-buying and selling needs. We can provide you with access to the local listings database and offer our experience and knowledge to make the process easier for you and your family. Contact Jean-Luc Andriot today to get your home search started.